Japanese knotweed (Fallopia Japonica) is an invasive alien. A pest. Feared by most gardeners or land owners, its root system is so aggressive that it dominates and eventually kills pretty much all other herbaceous life around it over the course of a few years. The root system is made up of incredibly hardy rhizomes that can extend to 3m deep and 7m apart. People spend thousands on control measures and often resort to powerful chemicals in order to free themselves of it. It is incedibly difficult to eradicate. Japanese Knotweed is a member of the rhubarb family, (polygonaceae family). 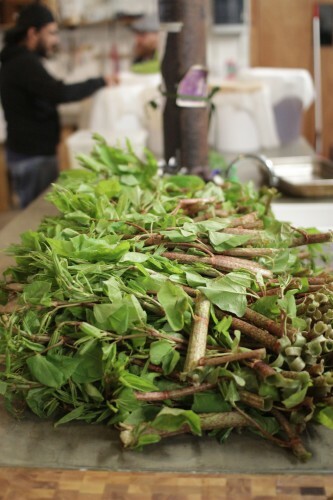 Other members of this family are buckwheat and sorrel. 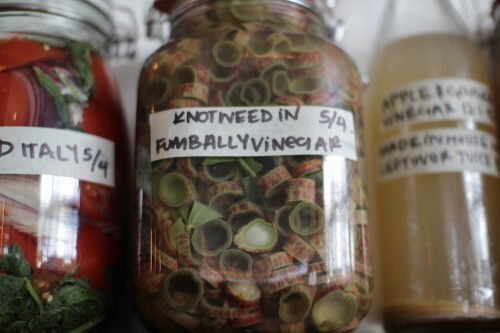 It tastes pretty much exactly like rhubarb and should be used pretty much exactly like rhubarb. – compote, crumble, tart, pickle etc. We have substituted the rhubarb sauce on our porchetta sandwich for Japanese Knotweed compote for the next month…..or however long we can get our hands on it. We also made some pickles and are thinking of other practical uses for it. 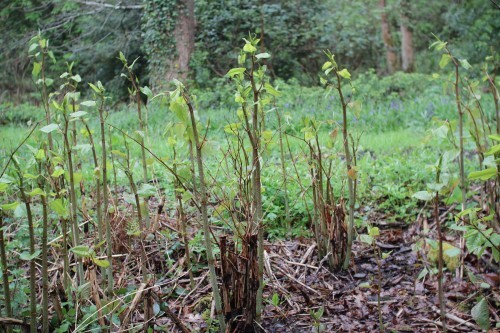 Now, the end of April/ beginning of May, is the time to forage for knotweed as you want to try and pick the young shoots (the first two foot of growth). 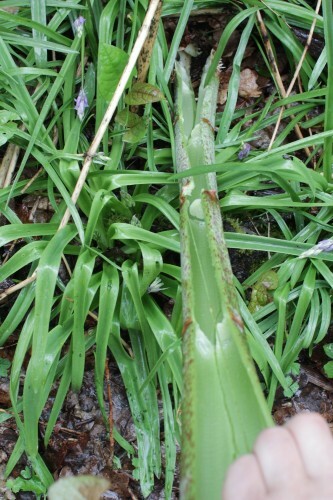 Once they grow tall the stems becomes a lot tougher and more fibrous and inedible. Bare in mind that it is extremely fast growing, extending up to three feet per month. 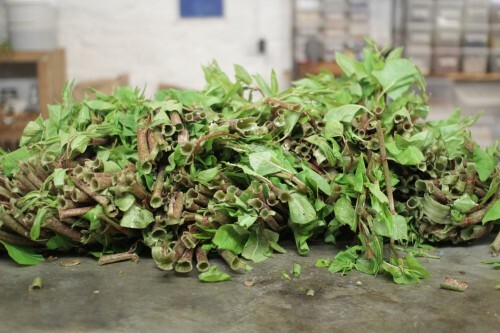 You would think that it is of the same family as bamboo for the speed at which it grows, and also the stem structure is somewhat similar, with internodes and hollow stem sections. However, it is nowhere near as strong. A four year old could easily push it over and snap the base joint while it is still in its first few months of growth. The decayed growth from last year is also very weak and can be broken easily, an antithesis to the power of the root system. Get the young shoots now though, and they are crunchy and fragrant, slightly tart when raw and quickly tender when cooked. Picking them young will discourage any further growth of the shoot. The stuff that we managed to harvest was a little bit taller than you would ideally want, but the top 12 inches or so are still good to cook with. If when you are snapping off the top you hear a distinctly melodic popping sound you’ve got a good tender shoot. If you have to tug it a bit, the fibres have already started to develop and you will get stringy tough segments of stem. 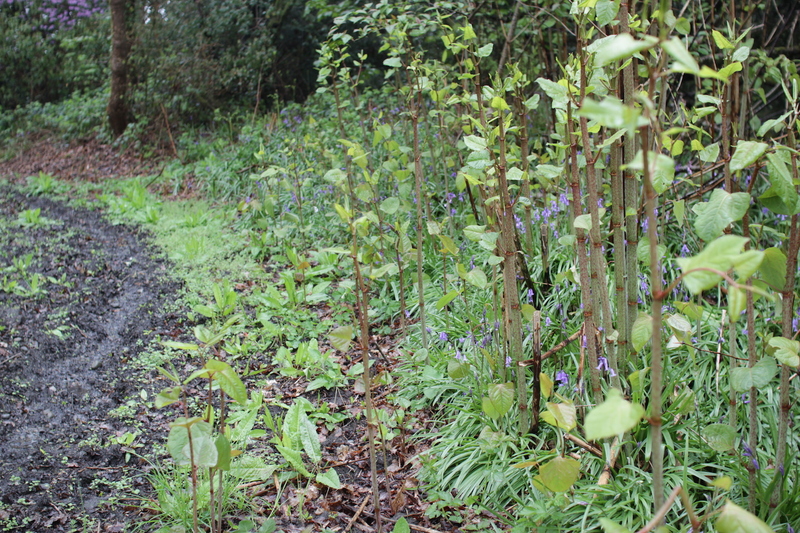 japanese knotweed from aisling rogerson on Vimeo. Simply picking the tips will not kill off the root system unfortunately though. Consistent picking over a number of years may lead to a die off of rhizomes but you could be at it for a good while. Which may not be a bad thing if you like to eat a lot of knotweed crumble! It is the aggressiveness of the spread that is worrying, however. 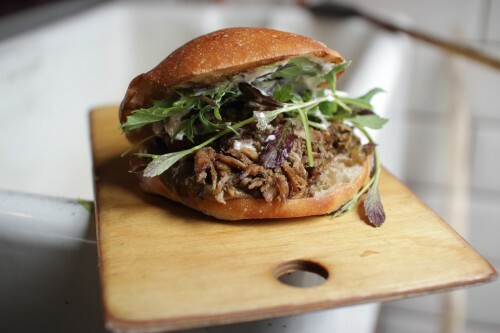 If you do decide to cook with it do not throw away or compost any loose ends. Use the whole stem that you have picked! You could even use the leaves as a spinach alternative (they need a good bit of salt though). Burn or blitz anything you don’t want to use though. This all sounds very extreme I know but the plant has an incredible capability to reproduce from even the tiniest stem cutting, so throwing leftovers into your compost and then spreading it over your lovely veg patch could be disasterous. Hmmm – not sure about doing this. 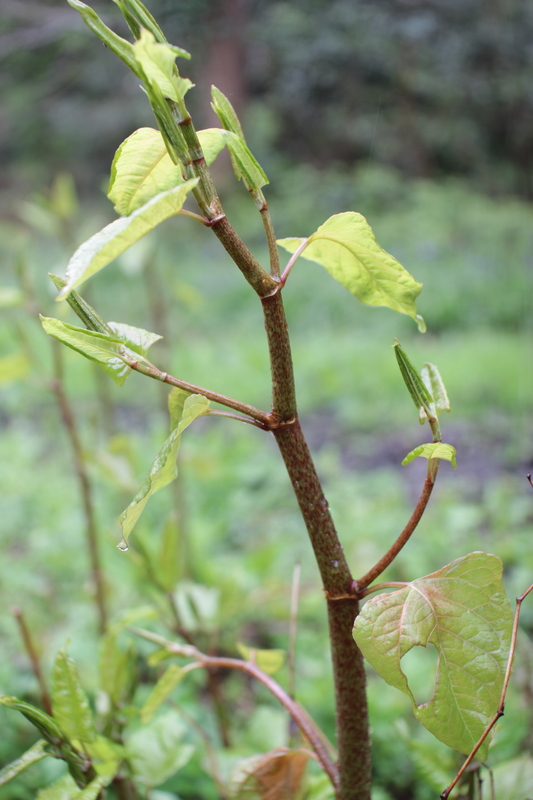 Japanese knotweed has an extraordinary ability to spread vegetatively, creating new off-shoots from even the tiniest amounts of a broken piece of stem / crown where left behind. Harvesting is likely to spread the problem and you should see the measures we have to go through to try and control / eradicate it from an area! Totally understand your hesitance….it is an absolute pest of a plant and a lot of people have psychological issues with eating it. But Surely eating it is a far better solution than spraying toxic chemicals to eradicate it, effecting surrounding soil and vegetation. One thing is for sure that you need to be SO CAREFUL when harvesting that you don’t cause future spread. That cannot be under emphasised!!!! You should NOT pick Japanese knotweed. 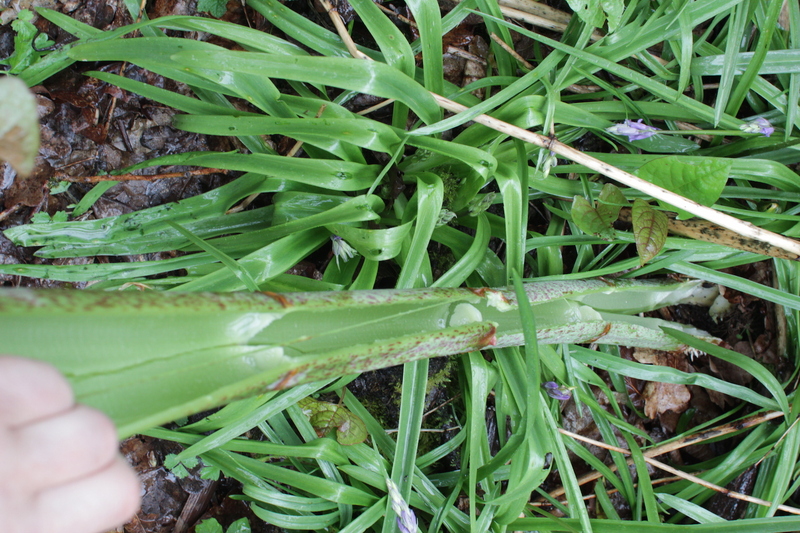 It thrives on being disturbed and can spread from a cutting as small as a fingernail clipping. Disturbing it causes it to spread. As you mentioned his is a highly invasive species which is seriously threatening Ireland’s biodiversity. Please please don’t pick it or promote others to do so either. Japanese Knotweed was introduced into Ireland over 150 years ago and has become widespread since then. It is an already established invasive species. One that is feared greatly. We are not promoting the spread of this plant, rather a change in attitude towards it. 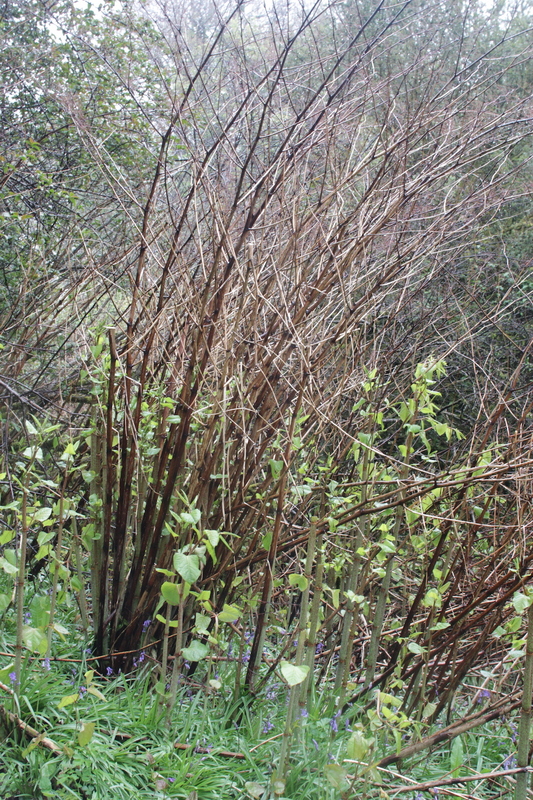 There are many people who have infestations of Knotweed on their land already and see it only as a pest, fearful that it will continue to dominate other herbaceous life. They have no idea that it is edible. When we asked the landowners who’s knotweed we picked, they were only too delighted for us to do so. Yes, this plant can be spread by the tiniest amount of neglect in care for its disposal. And we would ike to REemphasise how important it is to TAKE CARE with the movement and disposal of this plant. However, should you pick the young growth stems each year before they get too mature you are reducing the likelihood of development of rhizomes underground. Do this for a few years in a row and it may cause decay of rhizomes. The alternative is a lot of chemical sprays, which you also have to apply for a number of years before any permanent decay in rhizomes takes place. In the past people have been hesitant to pick the plant as once picked, its disposal is almost as dangerous as leaving it intact. Is eating it not the ideal means of disposal? Really insightful post guys. Was just telling my nieces and nephews about this plant the other day, but had no idea it was edible! Looks like there’s more to tell them now!